A recent Google search for the keywords “Baby Boomers” yielded 15.9 million results, while “Millennial” produced 264 million hits. And a search for “Gen X”? 421 million hits. It may be the only popularity contest Gen X has ever won. The so-called “slacker generation” has long suffered a reputation as underwhelming, without notable ambition or purpose. Since the proliferation of the Gen Y influence, they also are in between two much bigger, much more influential groups. On the other hand, those Google results might reflect some broader metaphor – the Gen X influence is far disproportionate to their number, and their impact is as powerful as it is unrecognised. And now, in their late 30s to early 50s, they are in the prime of their career. Gen X is already 51% of leaders worldwide. So how do organisations determine if Gen X Employees are ready lead? One challenge is that the definition of readiness has to be revisited. This generation is facing business challenges that Baby Boomers did not. Prior leadership experience may be less translatable than ever before. Economies are more global, the workforce is more diverse and the pace is faster. Management must continue to leverage traditional marketing while mastering ever-evolving new media. Consumer loyalty is challenged by increased customer autonomy, demands for transparency and greater expectations. Not to mention the very different and well-documented expectations of Millennial direct reports from prior generations. The test of readiness might be less about having enough skill-specific experience, and more about the ability to adapt regularly, and in unchartered waters. At the same time, many of the mid-life challenges for Gen X are no different than prior generations. This is when their domestic lives are at their most demanding. Many are married, have mortgage payments, and raising families. But older executives will have to resist measuring how Gen X employees balance even those familiar demands; past problems are under new circumstances. Wives aren’t home to pick up dry cleaning – they’re in the office down the hall. Technology has hugely increased speed and convenience of daily transactions, but it still can’t change diapers. And 24-hour connectivity means leaving the office is more geographical than experiential. Outcomes, not appearances, need to be the focus when assessing Gen X leadership capabilities. Gen Xers have traditionally been less willing to put in “face time” compared to Baby Boomers. But they hold themselves accountable, even when unsupervised. Which brings us to. . .
Gen X has more rank and file deference than Millennials, yet more self-reliance than Baby Boomers. Their childhoods are uniquely marked by the “latchkey kid” experience. Thanks to increases in both single-parent homes and dual-income households, they were more likely to come home to an empty house. They are able to figure things out on their own, learning from their mistakes, and motivating themselves. While Boomers might expect them to ask for advice, or Gen Y would employ group think, Gen X will likely go it alone. An employee who is Gen X is ready to lead if you see them take initiative to figure things out, and exhibit confidence in doing so. Their ability to problem solve, to identify and reach their own markers of success, to embrace their independence are signals that they’re ready to lead. What you won’t see? Overt efforts to highlight their achievements or directly ask for increased responsibilities. That’s not their style. 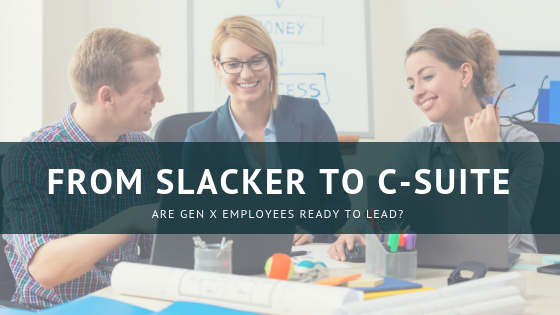 Gen X employees ready to lead, probably already are. Generation translation. Gen X is one of the least defined by their own era. They’ve never been large enough to drive markets or trends. Their talent is a keen ability to own the market, not influence it. Their technological advantage is not innovation, but translation – and most especially, monetisation. Gen X bridges pre- and post- digital experiences. They led the dot-com boom, but early e-commerce mimicked traditional transactions on an unfamiliar platform, persuading Boomer buyers with online shopping carts and digital checkout pages. Now Gen X translates to the younger market – using Gen Y’s social media to advance traditional corporate goals. Facebook’s founder is very Gen Y, but Facebook’s CFO is very Gen X. Millennials may shape the market, but Gen X owns it. Ask Amazon. To be fair, Jeff Bezos was born in 1964, and some argue that Gen X didn’t start until 1965. You can Google it . . . thanks to bona fide members of the club (Google Founders Sergey Brin and Larry Page were both born in 1973).